Diamond Finish is the hardest and most scratch-resistant lens coating now available. It will significantly improve the durability and life of your plastic lenses. Diamond Finish lenses also come with an advanced anti-reflection layer improving vision and reducing unsightly glare, and a unique patented fluid resistant layer, making your lenses easier to clean and cleaner for longer. As with all our plastic lenses full UV protection is included. How tough is Diamond Finish? 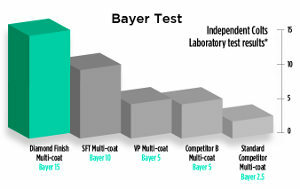 The Bayer Test is an independent assessment conducted to measure the scratch resistance of lens coatings. The higher the score the better the scratch resistance. Hoya Diamond Finish scores a 15 on the Bayer scale, which is better than some types of glass. By comparison, other premium lens coatings have a Bayer score of around 5 and standard/low-budget lenses have a Bayer score of around 2 to 3.